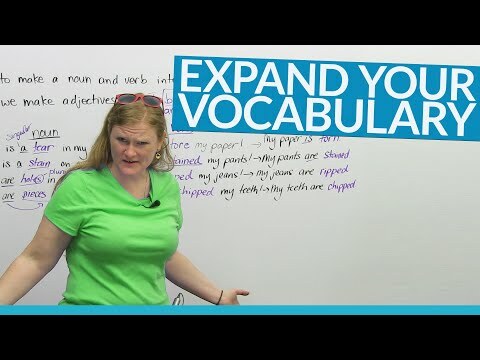 www.engvid.com/ Want to expand your vocabulary using words you already know? Today I'll teach you to make nouns and verbs into adjectives! You will learn to form adjectives using past participles. By using this trick, you will improve your vocabulary and sound more fluent. Practice your skills with the quiz: www.engvid.com/turn-nouns-verbs-into-adjectives/ TRANSCRIPT Hi. My name's Ronnie. I'm going to teach you a little secret. It's not really a secret, but it's something that's kind of interesting and really helpful when you're studying grammar, and more importantly, speaking English. It's more magic than a secret. It's a crazy little magic that I'd like to teach you. I'm going to do some magic tricks. The magic trick is how to make a noun and/or a verb into an adjective. So, how we make adjectives, or how adjectives are born. Ah, the birth of an adjective. So, I'm going to go through some examples sentences that have a noun. We're going to change the noun-dunh, dunh, dunh, dunh-and going to use the sentence as a verb, and then magically, we're going to change this into an adjective. Are you ready? Are you excited? Not real-... Not real...? Not really? Come on, it's magic. I'm telling you, it'll be... Okay, yeah, let's go. So, if you look at my first sentence, okay? "There is a tear in my paper." So, "shwi", my paper. [Fake cries] "There's a tear in my paper." We're going to know that this word is a noun with some very simple tricks. Because we have the word "a", a's an article, so: "There is a tear in my paper." We know that this is a noun. The next one: "There is a stain on my pants." What were you doing? And the se-... Or the next one: "There are holes in my jeans." Now, we have to change this, because "holes" are plural, we have to use "are". We can't say: "There is a holes." because "a" is only for singular. But when we have plural, for example, "holes" or "pieces", we have to use "are" because "are" is plural. Let's just write that down here. So: "There are holes in my jeans." And, uh oh: "There are pieces"-again, this is plural-"missing from my teeth". True story. I have pieces missing from my teeth. It's a long story. I'm not going to get into it when we're doing the magic. So, what we're going to do is we're going to take our sentence, we're going to take our noun-do, do, do, do-and we're going to change it into a verb. The way that we do this is we're going to change the noun into actually the past tense of the verb. For example: "There is a tear in my paper." The verb is "tear" or "tore". So: "I tore my paper." Next one: "There is a stain on my pants." What we're going to do is we're going to take the word "stain" and make it past tense. We're going to say: "I stained my pants." Just curious as to how you stained your pants, but that's fine. "There are holes in my jeans." Now, we can't say: "I holeded my jeans", because "holes" we cannot change into a verb. We're going to use the verb "ripped", so you can say: "I ripped my jeans." Rip. And: "There are pieces missing from my teeth." We can't say: "There are pieceded", but we can say: "I chipped my teeth." So, "chipped" means there's a piece missing. So what we've done, very simply, is we've taken our noun, and we've used it as a verb. This is where the magic happens. This is where the adjective happens. To make a verb into an adjective, we're going to use what's called the past participle, or as I like to say, the PP of the verb. So, we have the infinitive or the base form, we have the past form, and then the third form or the past participle (the PP) of the verb. So all we're going to do is we're going to change the verb "tore" to "torn". So we're going to say: "My paper is torn." We know that this is an adjective because we used the verb "to be". Next one: "I stained my pants." The adjective of "stained", because it's an "ed" verb is going to stay the same. We're going to say: "My pants are stained." Next one, uh oh: "I ripped my jeans." We're going to say: "My jeans are ripped." And last one, uh oh: "I chipped my teeth." You're going to say instead: "My teeth are chipped." The magic happens when we take the verb, and we change it into the past participle. This is how we make a lot of adjectives in English. You take a verb, you change it to the past participle. It's difficult to remember all of the past participles, but there are ones that we normally use more than others, and especially when describing things. Another example would be: "I broke my arm." Oh no! So "broke" is the past tense of "break". "I broke my arm." To make it an adjective, do you know the past participle of "break"? Break, bro... Broken! Broken. So, you're going to say: "My arm is broken." And all we've done, here, is we've changed the verb into-dunh, dunh, dunh-dunh-an adjective. And that's the end of the magic show. Enjoy your grammar. Видео Turn NOUNS & VERBS into ADJECTIVES! станет хорошим помощником в изучении английского языка.